This article will teach you how to prune a fig tree and how to espalier a fig tree. In the next late winter, select 4 to 6 of the strongest branches growing from the main trunk(s) to be your fruiting wood / main branches and prune away the rest. As mentioned, leave the 4 to 6 strongest ones, but be sure to stagger them around the trunk. Start pruning by removing any branches that are not growing out from your selected 4 to 6 main branches as well as any dead or diseased wood. If there are suckers growing from the base of the tree, these should be removed as well by cutting them off at their base. Next, remove any secondary branches (shoots growing off the main branches) that are growing at less than a 45 degree angle from the main branches. 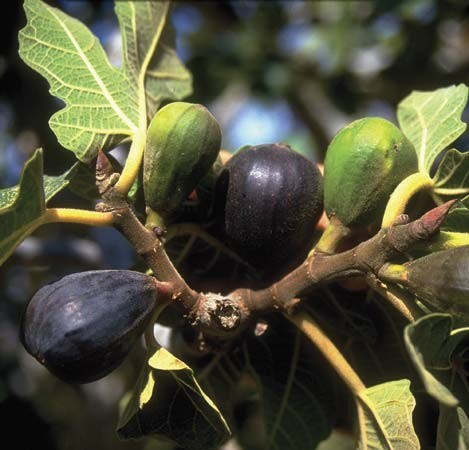 This step in pruning fig trees will remove any branches that may eventually grow too close to the main trunk and will not produce the best fruit. When all secondary branches have been removed, cut back the 4 to 6 main branches by 1/3 to 1/4 their length. This helps the tree, while it's still young, to put more energy towards the fruit that will be produced next year, which makes for larger and sweeter fruit. Following Years: Established figs are pruned very little and are productive with our without heavy pruning. Heavy pruning, as described above, should be done only during the first couple years. That being said, you can do some light thinning to remove any weak, diseased or dead limbs or stems. If radical pruning is done to control the size or to rejuvinate an old tree, whitewash the entire tree. See how you can shape fig trees on the next page.